Charan Singh Tyagi alias Charan Shandilya, born in a village near Meerut, U.P. in a reputed zamindar family on 12 February 1940. Brilliant student, gold medalist on graduation in engineering. As small industrialist, awarded five times at All India level and two times at state level for the excellence and highest export in engineering goods to the most sophisticated countries like USA and Japan. 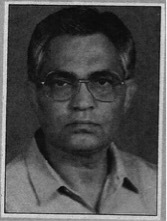 Participated in many revolutionary and political movements and at present after retirement running free consultancy in physiotherapy through PN1 (psycho-neuro-immunology). Fired in the sun of his own emotions he participated in the agitations and strikes of the students and the sugar-cane growers in early life. He had been General Secretary of the Students Unions in D. N. and N.A.S. degree colleges of Meerut and founder-President of the Students Union of MMH college, Ghaziabad. He worked as a trade unionist for 12 years. He was much inspired by Albert Einstein and the thoughts of Sardar Bhagat Singh and Subhash Chandra Bose. Before joining the Communist Party of India in 1959, he had been detained twice in public agitations and later severally (total duration of imprisonment is 44 months including the Emergency clamped down in June 1975). On division in CPI he opted for CPI(M) and did not renew his membership card after 1971 (though there were no ideological differences). Though differed with Naxalites’ approach but worked for their release and defence from 1971 to 1975. He had been admirer of Jawaharlal Nehru until this study. Supported Indira Gandhi during the period 1977-80. Being from a political family, he had been in touch with several Congress leaders like Feroze Gandhi, V. K. Krishna Menon, K. D. Malviya and H. N. Bahuguna. He had been editor of ‘Yug Chetna’ (started in early sixties) local Hindi Weekly of Communist Party, published from Ghaziabad. He had been General Secretary of All India Revolutionary Youth Front in 1972 and edited a monthly journal ‘Yuvanak’ until banned by the Government of India in 1975. Entrepreneur, Consultant & Writer. Having worked as a International Trade Professional, Consultant to EPC (Engineering, Procurement and Construction) & Sourcing Companies. Passion and interests in Sustainable Technologies in Energy Efficiency and Renewable Energy Generation, Water and Wastewater Treatment, Resource-efficient Industrial Processes, Advanced Materials, Transportation and Agriculture sectors. Special interests in the area of Research & Development to develop Products & Services that compete on price and performance while significantly reducing humankind’s impact on the environment across Asian Pacific Countries.